After completing Hakuouki, I was suprised to find that the characters I thought I'd like and the characters I liked in reality were two entirely different things. I went into it thinking that Okita was always going to be my favorite since I like other renditions of his character too, but it turned out to be a toss between Harada and Kazama. The romance between them and Chizuru just seemed more real to me than the others(especially Kazama, suprisingly). While playing the game I realized that the plot has this bad habit of not developing any actual love between Chizuru and the other characters until the last second. Then everything happens so fast, you can't help but wonder where it came from. Harada was a little like that as well, but I think his personality made up for the abruptness a little because of his natural inclination to protect women, and his openess with affection towards Chizuru. In Kazama's case, I was really shocked when I played his route. All through the other routes he seemed like a complete jerk. His own route however, feels like a more natural progression compared to the Shinsengumi routes. It was established at the beginning that he had an interest in Chizuru, so even though his route is the shortest, it's not as far of a stretch IMO. And even though he has quite a few hang-ups, when he starts to see Chizuru as more than just a tool, his interaction becomes so much more loving and thoughtful. My only regret during his route is that he didn't kill Kaoru(didn't even see him actually). That kid pisses me off. My romantic preferences aside, the game in general was pretty good. Sometimes the dialogue felt monotonous when I was going for a character that really didn't pique my interests though. And the rasetsu plot annoyed me. I would have been fine with a straight Shinsengumi plot, with the demons on the sidelines. A girl in the Shinsengumi is ridiculous to begin with, so I'm sure there were other ways Chizuru could have been brought in instead of using her dad being the doctor who was creating the rasetsu as an excuse. 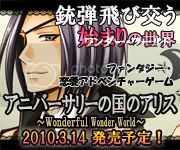 I have to give Otomate a thumbs up for keeping the story tragic though. Now if only Aksys would release the fan disk so I can enjoy some of the other characters more. I heard it has extra events that were supposed to have happened within the main story, and that the events were on the fluffy side. That would help quite a bit in helping me understand the romantic development between Chizuru and the other characters. I might be able to appreciate some of the other routes more. 25th-Nov-2012 02:13 pm - Pre-orders taken care of. 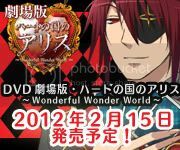 Well, I got around to pre-ordering Dia no Kuni no Alice and BWS -Last Hope-. The first attempt was a failure because both shops I tried to order from were already sold out. However, my second choice shops both worked out just fine. Initially with DnK I wanted to order from Imagine Web Shop because I wanted their extra drama CD with Jericho, Boris, and Sidney. The combination of characters looked interesting, and I already know someone who's gunning for the Tower Trio drama CD that Animate is offering. Unfortunately that plan didn't work, so I've now successfully pre-ordered through Quinrose themselves so I can at least have the extra booklet. 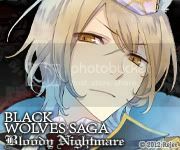 In the case of BWS, I wanted to pre-order through Stella-Worth so I could have the drama CD with Nesso, Zara, and Elza along with a special booklet. This fell through, and I was able to salvage the drama CD by ordering through AliceNET, but the booklet was lost. I'm glad for the drama CD though. I feel so-so about Nesso and Zara, but I wanted this drama CD because I think Elza is going to prove to be one of my top faves in this game. He had potential in BWS -Bloody Nightmare-, but he didn't show up nearly enough to really get a feel for his character. 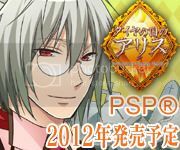 If not for him, I would have tried to pre-order from the shop that had the drama CD with Mejojo, Auger, and Arles. I'm hoping I won't regret my decision because I already know that I really like Arles. It's a game of chance with Elza. 11th-Oct-2012 06:47 pm - It's getting closer. 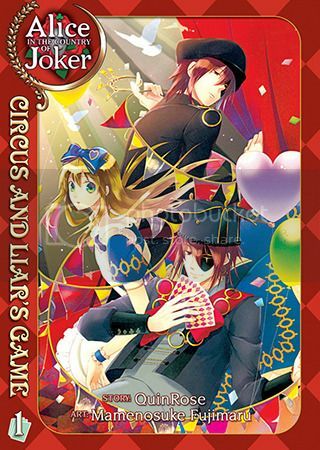 Seven Seas now has the pages up for 'Alice in the Country of Joker: Circus and Liar's Game' and 'Crimson Empire'. 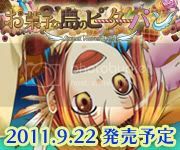 So far we only have the cover art for the Alice manga though. I vaguely wondered why they didn't use the purple theme with the cover image like the original version did, but I don't really care. This is still a nice cover. I wonder if the book will be the same size as the original since they seem to be borrowing some designs from the Clover books. I wouldn't be against a larger format, and it would make sense to make it larger if they want to keep things nice and orderly looking between the omnibus volumes from yen press and the Clover volume releases of theirs. 4th-Oct-2012 05:57 pm - Rant about one of Blood's endings. Although Anniversary has been out for quite a while, I've been slowly chipping away at it. Since I completed Heart, my motivation just isn't as high. So every so often I play one of the no-stay routes. In my last round, I decided to go for Blood. He's not one of my favorites, but I was just in the mood, and his character seemed to improve in Joker. I am done with his route now, and I've come here to vent because I'm rather pissed off. I'm not just angry with Blood, but Alice too. In the beginning Blood seemed rather cute, although there were some possessive undertones that would make most sane people concerned(but otome games don't use this logic anyway, so it is possible to ignore). I think things started going sour when he realized Alice had been giving him those hot stares because of his similarity to her ex(I felt bad for him at this point). Then he assaults her. I can somewhat understand that frustration given the situation, but there is still no excuse. Then after Alice runs off, she actually surprises Blood and me by coming back later! Sure the route wasn't over, but I thought that she'd be more sane than that, and Blood would have to come to her for the route to continue. Now all hope is lost because Blood decides he owns her. There are a few crazy, possessive events before the ball, but they aren't beyond my expectations for Blood. 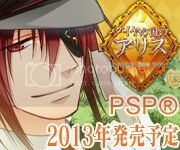 Then since Alice was staying at the Clock Tower during this route, she came to the ball with Julius and Ace. Julius and Alice get drunk as usual, and Ace...I don't know what Ace is. But Blood comes along in the classic no-stay route fashion and sweeps her away to the castle maze garden. He swaps the dress Julius gave her for something...well...better(sorry Julius, I can't deny this) and they have a good time. At this point I was feeling like maybe Blood isn't so bad. Then in his last events he is behaving like a complete jerk again. I realize this is subjective, but I wouldn't like someone telling me I belonged to them all the time. It kills the romance for me. In the end Alice tries to be nice and tell him that she is going home(why she would tell a crazy, possessive person about this, I do not know). He then forces her down onto his sofa(familiar territory for us Alice veterans) and bites her tongue and her neck really hard. There isn't a hint of sexual pleasure in this. Alice is bleeding and in pain. He just goes on to tell her that he won't allow her to go home, and tricks her into thinking she can't go by stealing her bottle and drinking it's contents. When she gives up, the bottle cracks. Now I won't blame all of this on Blood because I think that deep down Alice wanted to be stopped. She just didn't want the responsibility of directly making that decision. After she decides to stay, Blood won't let her go back to the Clock Tower or anywhere, and anytime she tries to leave, one of Blood's employees stops her. The more time that passes, the more cabin fever she experiences. At some point she snaps at Elliot who is busy detaining her from leaving. She grabs his ears and starts yanking them around, trying desperately to get him to let her go. He's loyal to Blood first though, and takes the pain while trying to settle her down. Eventually she gives up on him and comes across some faceless employees. They reveal to her that Blood really won't let her out because people will aim to use her against him, and her life could be in danger. She settles down a little once she understands that Blood has a reason other than imprisoning her. And later she is able to meet up with Blood and have a conversation/fight with him about how she'd like to be able to go out sometimes. She would especially like to see Julius to thank him for letting her stay at the Tower. Blood and Alice have a stare down over whether she can go or not. In the end Blood relents and allows her to go to the Tower. When Alice meets with Julius again, she tells him all about why she hasn't been back in such a long time. Julius tells her she's crazy for choosing to stay with Blood(I agreed). They say their farewells and Julius gives Alice one of his books to keep. Then Julius spots Blood waiting outside(because of the huge hat...lol) and sends Alice off to her doom. It ends with Blood and Alice holding hands, walking back to the Hatter Mansion where she will live with a creep for the rest of her life. I won't say that I hated the route, because I didn't. It just wasn't the romance I seek from an otome game. On the other hand, I liked the dark feel of it. I was reminded why Blood is the mafia boss. And the fact that it could invoke such red hot anger in me, made it a good route. But oh my goodness, Alice, "You are insane!". I'm completely with Julius on this point. Blood assaults her, she comes back. He starts calling her "his woman", and she puts up with it. And finally he abuses her and locks her away, and the moment she gets a taste of freedom, she doesn't head for the hills or get help. What the hell?! How is this the canon pairing? I like it better when these two are friends. They have a few things in common, and they play well off of each other. I just don't see the romantic chemistry. Did anyone else take a look at the opening for DnK that Quinrose posted? I'm getting so excited that I can barely contain myself. Sidney is starting to look better and better. Suddenly I started to wonder if he would be made the entire opposite of Peter. Like since Peter is a sadist trying to be a masochist, will that be twisted around with Sidney? I know there is no evidence of this. It was just a random thought I had while watching the OP. Or there is still the theory that Sidney is connected to Peter somehow(though I'm still against it). The scenes with Joker made me happy as well. There is now evidence that he will still appear in the circus and prison garb at times. So perhaps there will still be a connection between JnK and DnK after all. Sadly I saw no hints at a love route for him. I hope it's just a surprise. Another thing that made me happy was that we will get to see Ace as an adult sometimes. He seems to be wearing something similar to Joker's train conductor clothes in one scene. I'm very curious about where that will lead. 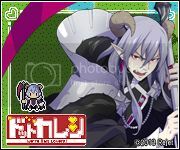 Elliot looks a bit more dangerous in this game than the previous ones. 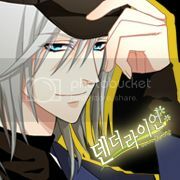 I know that he's always dangerous, but when he is just hanging out with Alice I'm used to him dropping his guard more. And while there was nothing that stood out to me about Julius, well, I just love him. It can't hurt to see more of him. I will remain reserved about Nightmare until I see how Quinrose handles his child version. 16th-Sep-2012 02:50 pm - Nearly made it. For the past several years I keep missing the autumn peek season up north. This year I decided to go earlier. 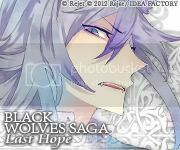 19th-Jul-2012 06:35 pm - Anybody notice that nice little thing Quinrose did for us? Basically I'm just posting to get some of the giddiness out of my system from playing Omochabako no Kuni no Alice. Most, if not all of it will be Joker related. Anything beyond this point could be a spoiler for those who haven't played it(so you've been warned). It took lot's of stalking YJ auctions, but I finally got them! 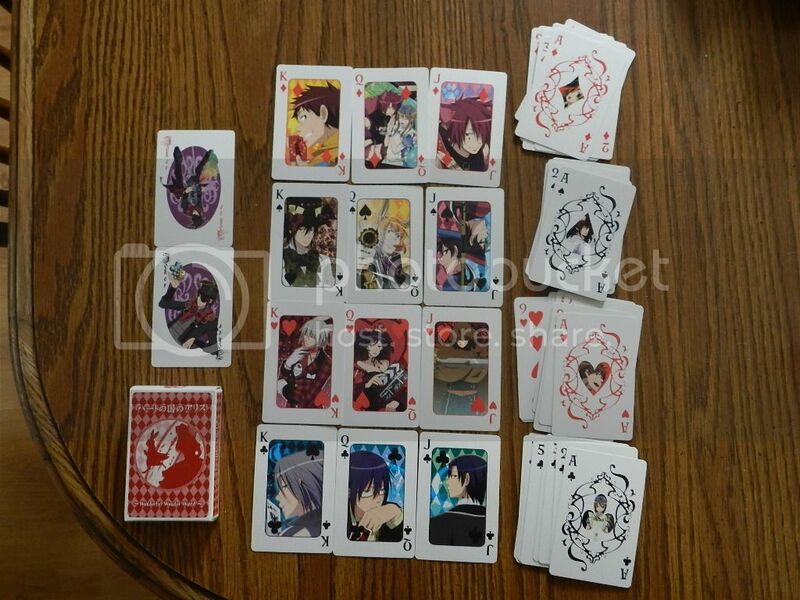 Now it feels like I need to cosplay Joker at conventions, and sit at a table accepting card game challenges. That would probably be lots of fun. I'm sure other Alice fans would be interested. Not sure what I'd do if they won though. 20th-Jun-2012 07:07 pm - I applaud Yen Press. I recieved the last omnibus volume of Yen Press's release for "Alice in the Country of Hearts" today(still waiting on the other two that decided to come late). After reading it, I'm very happy that I decided to buy it. Peter doesn't rhyme in their version, the Twins call Alice 'Sis' or 'Big Sis', and the translation in much closer to the original. So basically if you didn't like the TokyoPop version for those reasons, try the Yen Press version. Another thing I noticed is that the quality of the print is much better than what TokyoPop released. When I compared it to the original there was either no difference, or very little difference depending on the page. Overall, I'm impressed. Even though I have some issues with the original Japanese manga, the English version has become so much more enjoyable for me with the changes made to the omnibus versions. I assume it's because I was brought into the fandom through the games first. When I see the characters, I already have my own idea of how they should speak in English. Yen Press just happens to be much closer to how I view them than TokyoPop was. But either way, I'm grateful to TokyoPop for making people aware of a fandom that I care so much about, and Yen Press for giving me the translation I wanted. This page was loaded Apr 26th 2019, 3:01 pm GMT.